the title of that story/ad was "The Icemaster Cometh"
Powers/Abilities: Icemaster can generate tremendous amounts of cold and ice. He can also apparently reshape parts of his own icy body into weaponry, such as maces. He is vulnerable to intense heat, and to the sweet, sweet taste of Hostess Pies. History: (Hostess Pie Advertisement in Avengers I#191) - Seeking to create another ice age, the Icemaster had frozen much of New York City, only to face the Human Torch. Thinking quickly, the Torch threw the Icemaster some Hostess Fruit Pies, causing his ice to melt and prompting his effective surrender. (Thunderbolts I#24-25) - The Icemaster was one of 25 villains who joined the second Crimson Cowl's Masters of Evil. The Masters planned to extort billions from the world's governments through their weather-control technology, but their base was infiltrated by the Thunderbolts. The Icemaster, like all the villains except for Crimson Cowl, Cyclone, and Man-Killer, was beaten by the Thunderbolts and presumably jailed. (Thunderbolts I#158/Herc#3/Fear Itself: Homefront#2/1 (fb) - BTS) - Icemaster along with Aftershock, Ember, Living Laser, and Whirlwind, stole a craft and made a run for it, determined to wreak havoc. (Fear Itself: Homefront#2/1) - The villains attacked the town of Stamford, CT, where Living Laser blasted over a church steeple and the others tortured civilians. When Speedball attacked, Living Laser blasted him multiple times and they soon defeated the hero, but the villains chose to run for it. As they departed, Living Laser ridiculed Icemaster about consuming too many fruit pies. (Avengers Academy#20) - Icemaster, Aftershock and Ember were caught after a fight with Giant-Man, Justice, Speedball and Avengers Academy students when Jeremy Briggs knocked them all out. Briggs melted Icemaster's ice, revealing his true form. (X-Men Legacy#275 (fb) - BTS) - Icemaster was transferred to a prison in Upstate New York. (X-Men Legacy#275) - Ruby Thursday, Griffin, Schizoid Man, Icemaster, Quicksand, Silk Fever, Supercharger, and Lightmaster staged a prison break, but were stopped by Rogue and Mimic, as well as Guardsmen. (Gambit V#17 - BTS) - Icemaster was transferred to Pace Federal Penitentiary. (Gambit V#17) - Icemaster was one of the prisoners, which also included Griz, Lightmaster, Mandrill, Vic Slaughter and Supercharger, taking Borya Cich's offer to kill Gambit, who had broken into the prison, for one million dollars or 100,000 for aiding in his death. He participated in the battle and iced him up, but Gambit broke out of the iceblock. The fight was soon joined by Gambit's friends from MI13 and the Avengers Unity Squad. The prisoners failed to kill Gambit. Cary theorizes: Could Professor Sinkowitz, the anti-communist superpatriot formerly known as the Cold Warrior, have been mutated by his Skrullified gear? Furthermore, since the break of the Crimson Cowl's Masters of Evil, could he be committing crimes while masquerading as the most recent Blizzard? You can get the whole story, and some clever commentary from Seanbaby's The Hostess Page. It might not meet with the Comics Code Authority's approval, so kids, ask your parents before checking that out! In today's Comic Book Legends Revealed, there's a discussion of Frank Miller's early work - and one of his earliest pieces was the Hostess strip that introduced the Icemaster! It also notes that he named the character, because, as per a Roger Stern quote in the article: "Frank's Torch ad originally had him fighting a villain the agency named Iceman. Yeah, they had no idea that Marvel already had an Iceman character. Frank caught that and designed the villain we wound up called "Icemaster" (which sounds as though it should be a Ronco product)." So if and when Miller ever returns to Marvel, I definitely want to see him use this guy. "What, are you dense? Are you retarded or something? Who the hell do you think I am? I'm the goddamn Icemaster." Icemaster received a handbook profile in OHotMU A to Z Update#5 (2010). 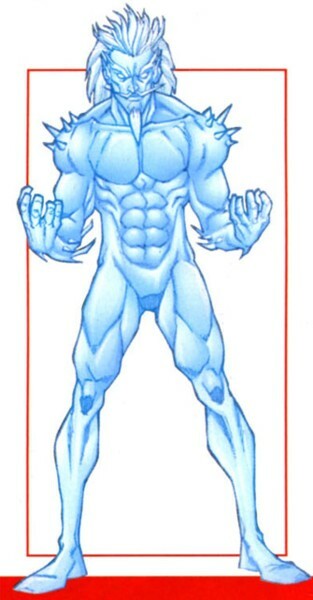 Though his origin stayed unrevealed a few assumptions were made including that he was an animated ice statue created by Shapanka, a native of Silocus, a remnant of Nebulon's "Frozen Man", a descendant of Frost Giants, an ice-demon from Boreas, an Ice-Devil or something else completely. I vote for some kind of mutate after Avengers Academy#20 revealed him to be pretty much human beneath the ice. The Avengers Academy entry in Avengers: Roll Call revealed his real name. Main image scan by MarvellousLuke.